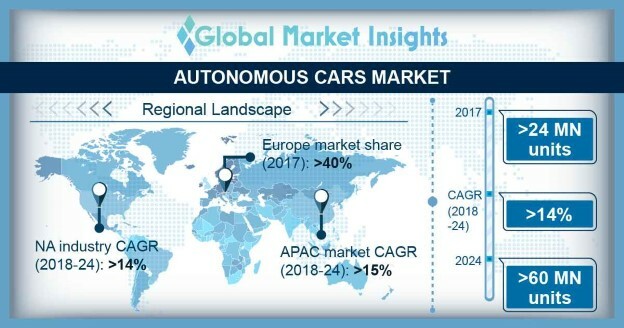 Autonomous Car Market size is set to exceed 60 million units by 2024; according to a new research report by Global Market Insights, Inc. The autonomous car market is driven by increasing investments in the auto technology. The self-driving vehicle industry is promising huge profits and lucrative returns on investment for all parties involved in the manufacturing and distribution of autonomous car. This is encouraging large corporations and VC investors to invest in the auto-technology and to secure their share of future profits. Moreover, advancements in the automotive technology also encourage the development of autonomous vehicles. The high cost of the autonomous vehicles is hindering the autonomous car market growth. The autonomous vehicles employ a large number of advanced sensors and electronic systems (such as LiDAR and cyber security software) to enable V2V (vehicle to vehicle) and V2X (vehicle to infrastructure) communication. The costs associated with these advanced sensors and communication networks increase the overall cost of production. The level 1 autonomous car market will grow at a CAGR of 6% over the forecast timespan. The market growth is attributed to the increasing vehicle safety concerns and governmental regulations for vehicle safety across the globe. Furthermore, the integration of the advanced driving assistance and safety systems into passenger cars also supports the market. On the other hand, the level 2 autonomous car market is expected to grow at a CAGR of 45% during the projected period. The advancements in the automotive technology such as the integration of artificial intelligence, GPS, and advanced electronic sensors such as radar, LiDAR, and ultrasonic sensors promote the market growth. The Hybrid Electric Vehicle (HEV) market is estimated to grow at a CAGR of over 60% during the forecast timeline. The demand for the HEV cars is driven by the growing investments by automotive manufacturers in the development of the electronics vehicles across the globe. The supportive government initiatives such as subsidies and tax benefits to the electronic vehicle manufacturers also propel the autonomous car market. Europe holds a major share in the autonomous cars market with a share of over 40% in 2017. The market growth is attributed to the presence of large number of automakers. The auto manufacturers have invested significantly in the autonomous vehicle technology to accelerate the innovative processes in the self-driving vehicle landscape. The governments in the region are investing in improving the road & telecom infrastructure, enabling the self-driving vehicles to better interact with its surroundings. The Netherlands government has invested over 100 million to install new traffic lights across the nation to help self-driving cars better interact with its surroundings. The North American autonomous car market is expected to register a high growth rate with a CAGR of over 14% in 2017. The growth in the region can be attributed to the supportive government policies, which have allowed automakers and tech companies in the region to conduct testing of autonomous technologies on public roads and freeways. The major companies working on the autonomous car market are Volkswagen, BMW, Fiat Chrysler Automobiles, Ford, GM, Honda, Hyundai, Jaguar, Mazda, Daimler, Mitsubishi, Nissan, Subaru, Tesla, Toyota, Volvo, Bosch, Waymo, Baidu, Uber, Continental GT, Aptiv, NVIDIA, Intel, and Autoliv. The technology players and OEMs are acquiring and forming alliances with various automakers to develop their own self-driving vehicles. These players are also partnering with regional and technology startups to develop AI-based solutions for autonomous vehicles. The players are focusing on strategic alliances activities with other expert players in the autonomous technology space. For instance, in 2018, GM has joined forces with Honda to fund and develop purpose-built self-driving vehicles. These vehicles will be able to serve a wide variety of use cases & will be manufactured in high volumes for global deployment. Similarly, in 2018, Here Technologies collaborated with Renovo to develop an advanced technology interface to enhance the utility of sensor information generated by fleets of self-driving vehicles. It will be a licensable software, which will be compatible with products from Velodyne, Metamoto, Parsons, Phantom Auto, and Verizon.